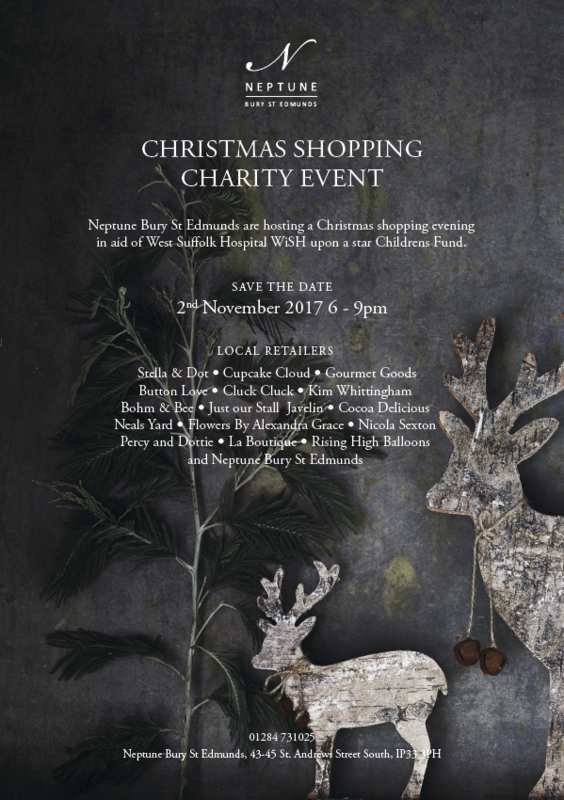 Neptune Bury St Edmunds are hosting a Christmas shopping evening in aid of West Suffolk Hospital WiSH upon a star Childrens Fund. The charity event will be held on Thursday 2nd November between 6pm and 9pm. There will be a number of local retailers at the event, invluding Stella & Dot, Cupcake Cloud, Nicola Sexton, Neals Yard, La Boutique and more. There will also be Prosecco, raffle, canapes and a harpist. All proceeds from the raffle and 30% of what is sold on the night will go to charity. To discover more about the event, download the poster below.